In a recent tweet, my good friend and colleague @JudyZaccheo posted the following "challenge"
Since this cannot be answered in a mere 240 characters or less, I had to respond "long text", and what better way than a post that can then be shared with all of you. Much like Judy, my first foray into GoFormative was perhaps a bit bumpy. At the time, I loved the idea of some of the question types I saw ("show your work", for example) so much that chose to present about it at a district PD, but I did not really use it much myself. This had nothing to do with the platform itself, but rather with my unfamiliarity with it. Back then, you created an account and landed on the home page but there was not much to see in terms of its capabilities, and my account remained dormant for a while. 1. The Formative Community Center: A vibrant community of educators that share content, best practices, implementation ideas and all sorts of ideas on everything from pedagogy to the latest in #edtech. What makes this community unique from others is that it also provides you with a direct line to GoFormative's amazing team of developers, who listen and respond with a "can do" attitude. To most of my "it would be wonderful if..." posts I have gotten a "we'll make that happen!" or at least a "we cannot do that right now, but what if we ...; would this be useful?" 2. Ability to create multimedia-rich lessons with just a few clicks. Not only does GoFormative allow you to include a wide variety of question types, you can also embed all sorts of media. It is almost an "if it is on the web, you can add it to a Formative". Even if there is no obvious embed code on whatever you want to add, a simple iframe generated using the tricks learned in the Formative within a Formative mentioned above makes everything embeddable. In this "Relationship between Organisms" example, I have not only a presentation and videos, but also LearningApps and a Flipgrid. 4. Ability to assess and provide feedback in real time, with no lag! Gone are the days when you have to wait for a student to submit a paper or finish the digital work. With GoFormative you can immediately send feedback to a student or group of students - even whole class, while they are working on a formative. 5. Identify the struggling student, find patterns in answers and be ready to pull a small group or even get everyone's attention to clarify a misconception or difficult concept. 6. Track student progress towards mastery of standards. 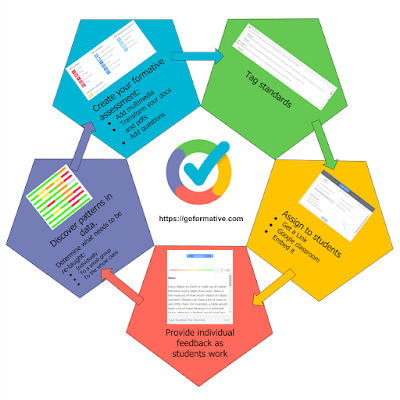 All you need to do is tag your standards, and Formative will summarize all the data for you! 8. Google classroom integration. Whether you want to import your classes from GC or you want your formatives posted directly to GC, it is all available to your students with the click of a button. No need to remember passwords or try to find "what they are supposed to do". Now, this is not to say that you have to do all of this. GoFormative is so versatile that you can even produce a quick GoFormative on the fly to act as an exit ticket or as a "Do Now" in a matter of seconds. That versatility is the reason why my students now equate GoFormative with being successful in my classroom. Every year at this time, I get pushback from many of my educator friends and the parents of my students for AdVENTURE's "Once a Zero-Always a Zero" policy. I hear cries of "how is a student able to recover from this demotivating policy", "this sets up kids for failure" and "this policy promotes a fixed mindset". It seems that I am alone in this world of "First Attempt At Learning" mentality. The adults hear "zero" and appear to stop listening to how the policy is actually implemented. What is very interesting is that I do not hear the same cries from the students sitting in my classroom. The students that are actually living and working with this policy in place, understand what it means, how to avoid that zero and most especially how it actually sets the stage for ongoing feedback and "re-dos". The only way a student in my classes will ever get a zero for an assignment is for doing absolutely nothing by the time the work is due, and I mean exactly that. Zeros are avoided by simply putting in a name on a paper and/or clicking turn in/submit if it is digital work. This is our way of having students acknowledge that there was a due date for the assignment and that if they "forgot" they are aware that there is work to be done. After what could be a pretty much blank turn in, everything is re-gradeable for full credit. The Once a Zero policy at AdVENTURE, actually allows my students to, dare I say it, "Fail Forward". The idea is that instead of having students turn nothing in or extend due dates waiting for the student to turn in "perfect work", I'd much rather have a student turn in a piece of incomplete or badly done work, go over it and give feedback and set up a conference where we can talk about the pieces that are hard for him/her, and regrade (often several times). In order to achieve this, I have to know where the struggles, errors or misconceptions lie, and I cannot do that if the student simply avoids the whole thing and does not turn anything in. The student who turns in something that he/she knows is not perfect and knows that by turning it in he/she is acknowledging that help is needed, also knows that help is on the way. He/she knows that there will be multiple opportunities to regrade until the work is where they want it to be, so in reality, this policy ends up fostering the growth mindset of the lifelong learner. "I could not do it when I first turned in, but I can do it now." 1. We really do not allow students to not turn something in. On turn in day, you will often hear the call of "everyone stand up, you may sit when I say your name", while I go over the list of papers/digital submissions that I have. Anyone left standing after this gets a visit from me and cannot leave the room until whatever they have has been submitted, again even if basically blank with just a name. 2. The relationship we have with students is one of trust, where they know that resubmitting is not only allowed, but encouraged, and re-grading is as immediate as possible, always for full credit. The onus is on the student to take that first step by submitting what they have. "Once a Zero, Always a Zero" has actually helped us become better at feedback and motivated our students to continue their learning journey as more empowered individuals. They have come to expect that a first attempt can always get better and that if they take that first step of submitting their work, their teachers are there to help throughout the process.